I was not always a morning person. The thought of disturbing the cerebral wonders of rapid eye movement was a crime punishable by serious adolescent b***h face and erroneous anger. So when the warm air floated through the open window from the Parisian corridor below it woke me up from jet lag with sweet disposition. I relished in the daydream made real. When my eyes fully rose my nose was quickly awoken by the smell of fresh bread, sugars and a mélange of cold meats. I made creaks and thuds rising to my feet trying to be quiet in the Belle Epoch style building as I made my way closer to the scent of food. I obviously overslept as much as I thought I had and made it in time to catch lunch accompanied by the MTV news update with Kurt Loder. Although, in MTV’s trying defense, It's hard to miss something that airs five mins to the hour-every hour. And yet each time it reeled I watched it. It was just about the only pure english spoken that I had heard on the Television, and I was beginning to miss just basic English-Speaking nonsense. I had only been in Paris a couple days and had already felt more akin to the walking, sights and feels of France than I did at home. There was a sense of getting lost and finding all that Paris could deliver which was not a way I would speak about my hometown at that age. After lunch my parents more or less set out the day and I would either grunt, snarl or cheer for the things that interested me. My father would want to look at the map and make a clear route or at least an idea of where we were headed so he could gauge the time frames for the journey. My mother fell more into the “ I'm on vacation, let’s just go” approach. I would use this time to choose which musical interludes would carry me through the streets. As I flipped through that Cd case the decision was made quickly. By the time my parents had made theirs, I was into track three of Musiq Soulchilds “aijuswanaseing”. I couldn't overtly share how excited I was whenever we went places. I had spoken too much of resenting the touristy things and there is nothing stronger than the stubbornness of twelve year old pride. When we set off down the path I started walking with an intent that almost had me made. With the anti-shock doing the best it could amidst the irregularity of concrete to cobble stone, I let the notes take each step to a living daydream. I all but mouthed the words with their own choreography. I don't remember whether we took the train from 30 rue de Saint Petersbourg or walked the whole way. The idle mind didn’t exist for me that Summer in Paris. I had set my attention to everything and everyone. Everytime we set foot in one direction or another I would often get so wrapped in the textures of things so new and desired that I couldn't ever remember where exactly we were going until we got there. 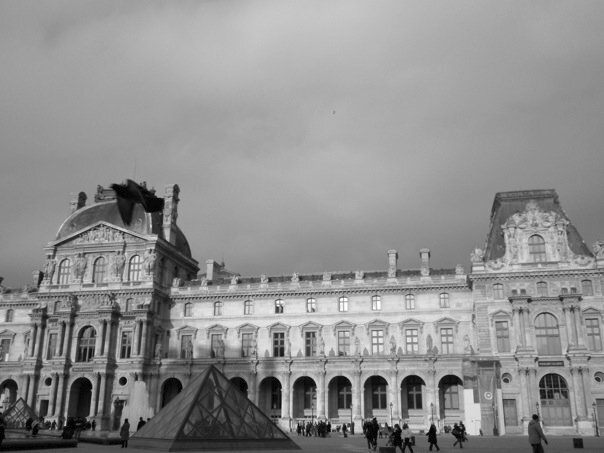 That very thing happened when we arrived at the Louvre that day. With the Jardin Des Tuileries at my back an old castle in front of me I felt like the moment itself was exactly the type of scene I always wanted on a random a** Wednesday. We took the traditional photographs. First with the box cameras and then with my father's Canon. Going down the escalator under the giant pyramid of transparent sky was the best introduction to what I would later call one of the best f***ing places on earth. The line wasn't too long and I didn't see a reason to wait with everyone else as I wasn't the one paying. I ducked under the black ropes and mazed my way out of line in direction of the numerous gift shops and the Virgin record store that shined the brightest. I had brought my Cd case with me in my messenger bag and wanted to see if there was something I could grab just to say I had bought it there. Along the aisles and at every cash register was the square red promotional poster of Aaliyah’s self-titled album, Aaliyah. I had already fallen in deep obsession with the debut single “We Need a Resolution” and the video to which MTV, BET and The Box played on constant repeat. Something that helped me in learning the entire dance from the video in hours. I went straight for gloss wrapped Cd and clutched it while closing my eyes; in visioning that after my parents had bought entry into the museum that they would want to generously aid me finding some music to play while in said museum. I could hear my mother whistle our call & response and so I responded but tried not to move. A trick I would set in motion when I wanted her to find me where I was and not the other way around. When my mother finally found me I had made my way to the front of the store near the cash register. I smiled as she approached and began my dance of charm and plead. There were very few things that I couldn't lure out of my parental units. My being on the trip alone was an example of my success in that right as my parents anniversary was the initial premise of the trip. It was all about how I went about it. Actions that could roughly rival Rhoda Penmark. She bought it. The album and it’s reasoning for ownership. I think ultimately she was content with anything but another Britney Spears anything. I literally could not wait to listen. The wrapping was disposed of, cd case in my bag and the disc in the player before we left the store. I had yet to press play as I wanted to have a setting that could play along and we all had yet to make a choice on where we would start our attempt to see it all. Egyptian Art became the easier pick. Our family room in the house was basically the inside of a pyramid anyway so why not go with what you know and let it grow a new from there. Plus it was easier to get there for starters than trying to navigate through the Baroque period just because we could. I placed the broken headphones over my ears and entered a dark tomb as the beginnings sounds of Track 1 emerged. There could be no hiding of the wonder that fell upon me. I had read a couple history books by then and had seen enough films to have a general understanding of the ancient Egyptians but there is nothing like seeing one for the first time. Preserved to perfection by their own methods of autopsy and embalming, the mummies and the sarcophagus that adorned held me still. As I passed through from the tombs of the great Kings and Queens it was on to trinkets, jewels and pottery. The detail not only to function but fashion was something carried out in every artifact. One distinction that I made as I thought to the differences between their forks and bowls to those of my own century was its exquisite beauty. So intricate and fine the turquoise cradled by the snake that wrapped itself around the handle of a mug. Or the gold that coiled in elaborate grace that seemed to be on everything whether garment or table object. I felt the history of invention. The intellect to create that was triggered by the necessity or survival. There were many things I couldn't name. Pieces of the past that due to social or pure human function had been outdated and no more served a purpose. One thing in particular that caught my attention were the elements of pageantry that have remained. The long cloaks of regal beading and structural poise that mirror the archives of a couture fashion house. The crowns and head dresses made for members of the court down to those who in the river nile stabbed for dinner or plucked for greens. And the wigs. I marveled at the wigs not for how well managed and kept they had been after thousands of years, but for the style in which they were made. All of the wigs were braids. All of them. Either short with bangs and a head wrap sewn in or long and abundant like a lion's mane. I was not in awe at the newness of it for It was a something I had seen before. I recognized it as “Black”. It was like looking into a hair book at the shop and choosing which style you wanted. I was sure of this fact and soon began to look around at the wandering faces and camera lenses in curiosity. Did everyone else see what I saw? From that moment on that particular wing of the museum was seen under new light. Not only was I viewing the past of mankind, I was looking deep into the history of my own people. Black People. The weirdest was that I felt like no one talked about it. I started to think back to my previous history courses and the movies I had seen, and each one had failed to deliver an honest integrity and representation of the ancient egyptian people as African people. The manipulation of documentation and institutional teachings of Ancient Egypt put the Ancient Egyptian in a league of their own almost as if to separate them from the African diaspora knowing the very thing that they are praised for is the very truth that would destroy the reasoning of racial inequality and prejudice. As Aaliyah sang on, I found myself diving deeper into the realisation and awareness that the figures on the wall looked like me; a little black boy from Oakland California with natural hair. The sculptures made of marble and alabaster had my high cheekbones and forehead.I’m sure they once had my nose and it was that fact that called for the mutilation of such African features on many artifacts. The portraits and murals detailed on scrolls and walls of papyrus and stone were of men, women and children who bore my shade of brown, if not darker. It was beautiful. And in the midst of that beauty I found confusion. The truth of my African history was hung and mounted for worlds to mesmerize. I was not cognizant of the importance and speciality of it then, but as the years go by certain memories only grow stronger. 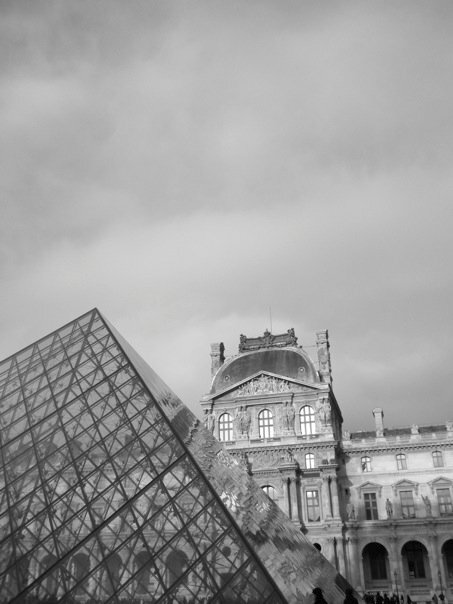 The history that was experienced in the days spent at the Louvre continued to fuel my thirst for knowledge and cultural inquisition. Our factual documentation as African Royalty and people of vast lands, inventors of scientific studies and mathematical equation and masters of fashion and design filled the space in spiritual abundance and yet purses were still clutched tight in my presence and eyes ablaze as to how this little n****a from the Bay made his way to the corridors of the Louvre Museum. When I felt their ignorance poke at me I would respond in my head and smile, “ First Class B****”. Maybe it was the rhythmic motions of "Rock The Boat" that made me look at ease in a space initially unfamiliar. The captivation of the sights while the mind is lead by the harmonies of good music is a moment akin to beauty. *Aaliyah passed away three days later on August 25th, 2001.